Google's R&D lab may have patented the creepiest technology ever - teddy bears that record conversations and follow your every move. Toys are super amazing to display or play with, but I think we can all agree: In the wrong context they are super creepy. 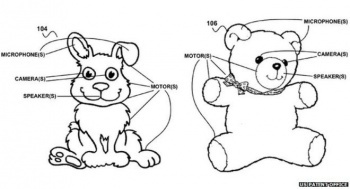 We've been learning that the hard way from Google, of all companies, whose R&D lab just published patents for internet-connected teddy bears and bunnies. These stuffed animals are fully equipped with microphones, speakers, and cameras that monitor children at all times. And while that's a subtle, if unsettling, way to watch your kids, Google went a horrifying step further - adding motors so the toys can turn their heads to make eye contact. Created by Richard Wayne DeVaul, these plans were submitted in a 2011 patent that only now saw the light of day. Each toy has a "trigger word" that wakes them up to face the person addressing them. The toys could also turn their heads to look at anyone speaking in the room, use speakers to respond, or depict human emotions like interest, curiosity, or boredom. "To express curiosity, [it] may tilt its head, furrow its brow, and/or scratch its head with an arm," DeVaul wrote, presumably while being watched by the teddy bear overlords. While teddy bears and bunny rabbits were proposed designs, the concept could be applied to any child's toy - dragons and aliens are both mentioned as examples. According to the patent, the key is that the toys should be cute so young children are encouraged to interact with them. "Young children might find these forms to be attractive," it reads, "However, individuals of all ages may find interacting with these anthropomorphic devices to be more natural than interacting with traditional types of user interfaces." But that's not all the toys are capable of - they can control your home as well. According to the documents, the WiFi connection lets them access TVs, DVD players, thermostats, window curtains, and lights. This way, when you enter a room and are recognized by a toy, it can automatically alter electronics in the room to suit your needs. In fact, the documents suggest this idea will be so popular that families will want multiple toys across the home - including bedrooms. Yup. Can't see how that would ever go wrong. Setting aside how freaking creepy this all sounds - mechanical teddy bears don't look nearly as joyful as animations after all - there are also a host of privacy concerns. "The privacy concerns are clear when devices have the capacity to record conversations and log activity," Big Brother Watch Director Emma Carr explained. "When those devices are aimed specifically at children, then for many this will step over the creepy line. Children should be able to play in private and shouldn't have to fear this sort of passive invasion of their privacy. It is simply unnecessary." To be fair, monitoring children with cameras isn't new - the question is actually slipping them into beloved toys goes a step too far. Either way that's a concern for the future since these designs are still in the patent stage... unless it turns out Five Nights at Freddy's is more accurate than we dreamed of.